When the phonemonon of creme egg recipes combines with my own passion for Scottish recipes you get a seriously sweet Easter treat. Mini Cadbury Creme Eggs are combined with traditional Scottish Tablet for a confection that is seriously naughty but nice. Easter. Time for chicks, eggs, lambs, flowers, bunnies, chocolate and CREME EGG BAKES! They seem to have become a real 'thing' in recent years and I've watched my fellow food bloggers create some absolute masterpieces incorporating them. Last year I jumped on the bandwagon for the first time with my Creme Egg Pancakes. This year I'm taking the sweetness even further with Creme Egg Scottish Tablet. Tablet conjures up many childhood memories for me. My Grandma Corntown was a prolific maker of it for sales of work but hers came with an unexpected added ingredient. The unmistakable stench of cigarette smoke (Embassy No. 1 as I recall). Tablet is a particular Scottish Confectionery, not to be confused with fudge or toffee (although sometimes it's know as Swiss Milk Toffee) It has a crumbly medium hard slightly grainy texture and should be consumed strictly in moderation. Cut into SMALL pieces - it's super sweet! Grease a Swiss Roll Tin with the extra Butter. Cut one pack of the Mini Creme Eggs into halves and the second pack into quarters. Put the Milk and Butter into a large heavy based saucepan (mixture will double in quantity as it heats) and warm through until the butter has melted. Add the vanilla extract and granulated sugar and heat until the sugar is FULLY DISSOLVED. Turn up the heat and Boil for 10 minutes (rolling boil) stirring CONSTANTLY with a wooden spoon. Beat for 2-3 minutes with a wooden spoon and pour into the buttered tin. Work quickly to carefully place the pieces of creme egg into the tablet. Leave to set, scoring squares after about 5 minutes. 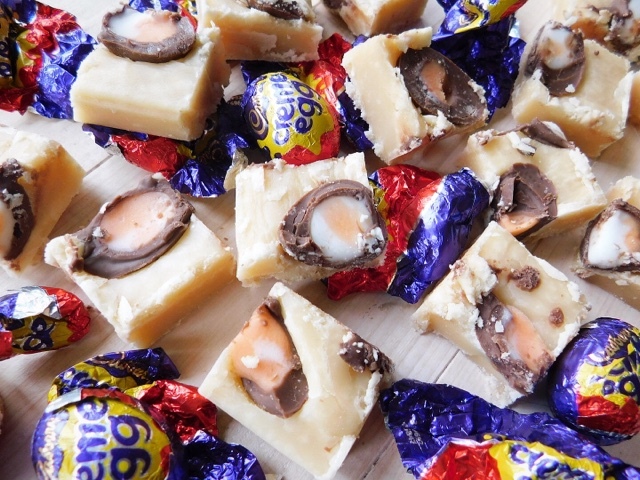 Fancy some more slightly weird yet wonderful Creme Egg Creations? I've got you covered! Holy moly, they look insane Claire! I wish I could consume dairy cos I'd be all over them!!! Oh no! Sorry you can't indulge but your waistline will thank you. Super sweet! I have some fab Bunny Bags that I'm going to fill for Easter gifts. Wow! This looks deliciously naughty! Other half loves creme eggs so have pinned to make this Easter! Oh wow what a delicious treat! 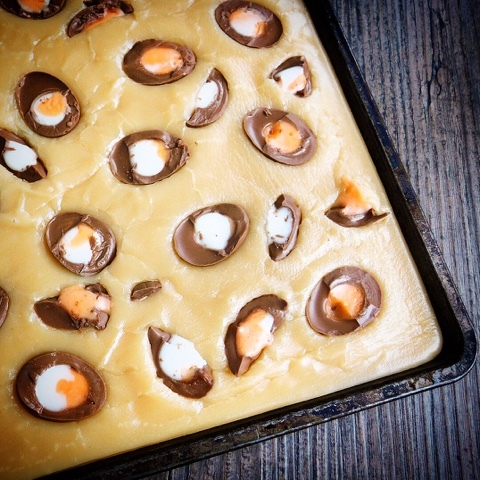 I am making my first creme egg recipe this year so I'll be coming back to you for inspo! Can't wait to see what you come up with. So difficult to make something new. 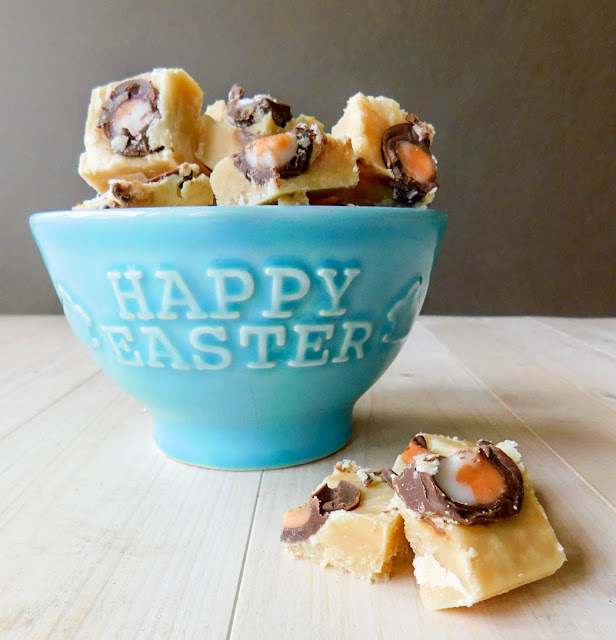 Whoa, I've never heard of a tablet before but this is one lush dessert for Easter! Tablet is a particularly Scottish sweet treat. Once tasted never forgotten. Wow sugar rush doesn't even cover it!!! This looks amazing... perfect for a day out walking to keep everyone motoring!!!!! Tablet is absolutely perfect for a day walking in the Scottish hills. I suspect that's the reason it was invented in the first place. Oh. My. Word! That's an Easter treat and a half! You made my eyes pop out! Whoa! That looks like one seriously decadnet treat! Yup! Decedent just about covers it. I want to make this right now. Cadbury creme eggs are my absolute favorite chocolate of all time! YUM! Keep it to yourself but I'm not a huge fan, the little ones suit me better, the regular size is just too much. Oh my!!! I wish I had all the ingredients at hand to make it straight away - it looks absolutely delish!!! Get those ingredients on your shopping list right now! I actually don't like cadbury cream eggs at all but I'm seriously excited because I once had tablet and LOVED it so much, but I had no idea what it was. Your pictures and description match what I had so now I can make it too. Thanks so much! 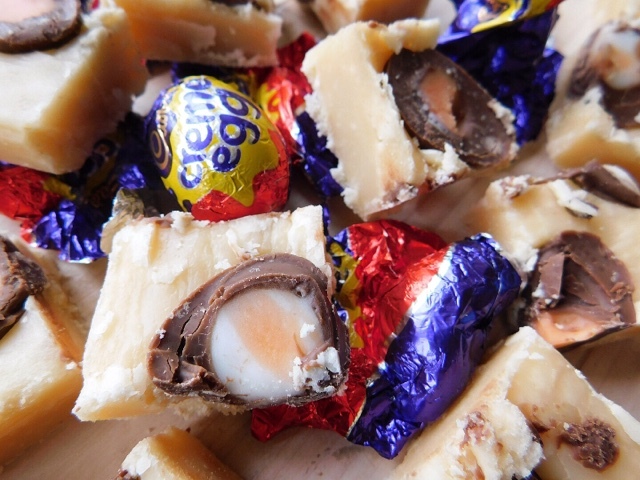 You can absolutely make this without the addition of creme eggs. So pleased to have helped you track it down. Wow! What a sugar overload but I know my husband would absolutely love this! Yup it is SERIOUSLY sweet! You really should make it for your husband this Easter. Thanks Kirsty - it's been really popular. Thank you for adding these to #TreatPetite Claire. My teeth hurt looking at them but I just know I would love to give this tablet a go!